"The only merit I see in myself is that of being able to compete as a millionaire with Mr. Aguado or Mr. Rothschild" says the Count of Monte Cristo to the young Viscount Morcerf in chapter 38 of the second volume of Alexandre Dumas’ novel. Under the Restoration, the bankers Alexandre Aguado and James de Rothschild were considered to be the richest men in France. While the first is no longer remembered, the second, along with his family, remains in our collective subconscious as a symbol of power and wealth. For over two hundred years the Rothschild name has stood for fortune, industry, art de vivre around exceptional properties and sumptuous art collections as well as many charitable entreprises, all exemplifying the family motto : concordia, integritas, industria. The exhibition on the Rothschilds in the 19th century staged by the Bibliothèque nationale de France pays tribute to the bicentennial of the arrival of James Rothschild (1792-1868) in France. The fifth child of Mayer Amschel Rothschild (1744-1812), he settled in Paris on 3 March 1812 to develop a new branch of the banking and financial institution held by the family. This is thus the official date marking the beginning of the Rothschild saga in France. We might as well immediately confess that we find the exhibition at rue Vivienne almost too understated given the possibilities provided by the incredible history of the French Rothschild branch. Yet, things start out well with, at the entrance, a beautiful portrait of James (ill. 1), as a dashing and elegant young man, ready to conquer the world. This painting is infused with Romanticism and we regret that this image was not used for the exhibition poster instead of the likeness depicted by Paul Flandrin, held by Rothschild & Cie Banque in Paris, a copy of the canvas produced by his brother Hippolyte Flandrin. It shows us an older, heavier version of James de Rothschild with, above all, the air of self-satisfaction now a caricature of the French bourgeoisie of the Second Empire. True, the catalogue tells us that Betty de Rothschild, James’ wife particularly appreciated the original portrait which she had requested in her will should hang at Château Laffite next to hers by Jean-Dominique Ingres. But in today’s world, when bankers have fallen out of favor, the effigy advertising the exhibition in the streets of Paris does not exactly strike one as "sympathique", a drawback when trying to attract visitors to a show. After passing this canvas introduction, the museum-goer arrives in the first room and here, to his great surprise, will discover an entire space devoted to the Pereire brothers, Emile (1800-1875) and Isaac (1806-1880). Starting a retrospective on the Rothschilds with a detailed presentation of their main competitors might seem a strange procedure. However, the Pereires have an important place in the financial and industrial history of 19th century France. 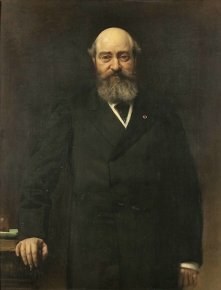 Early in his career, Emile was employed at James de Rothschild’s bank where he probably acquired the necessary expertise to then start his own business. The Industrial Revolution was just taking off in France and opportunities abounded. The Pereires and the Rothschilds were later to become associates or rivals, both in banking as well as in railroads and real estate. All of these adventures are recalled thanks to various documents presented throughout. Thus, we see the first railway passenger line, from Paris to Saint Germain-en-Laye created in 1835, in which the two families were associates or the launching of the Compagnie Générale Transatlantique in 1855, illustrated thanks to three maquettes of steamers. The Pereires also participated in the remodelling of the French capital carried out by the prefect, Haussman. 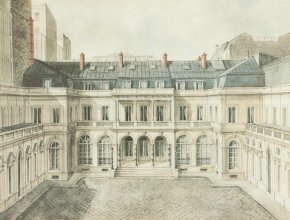 In order to welcome visitors to the Exposition Universelle of 1855, they constructed the Grand Hotel du Louvre, then financed several residential complexes in the neighborhoods located on rue de Rivoli, around the Parc Monceau and the Opera where they also helped to build the Grand Hotel. Besides the beautiful portrait of Isaac by Léon Bonnat and the famous canvas, Leaving the Opera by Eugène Lami, often used to illustrate the glittering society of the Second Empire, visitors will be sure to notice the photograph by Alphonse Terpeau (1839-1897) of the Villa Pereire in Arcachon, the seaside resort near Bordeaux created by the Pereire brothers, with the imperial family visible on the balcony. The following room leads to the world of the Camondo family, the Rothschilds from Eastern Europe. The ties between the two families differ here. Neither associates nor rivals, the Rothschilds and the Camondos followed parallel paths which included the worlds of finance, high society, the taste for collecting and philanthropy. We meet up again with Léon Bonnat in the portrait of Count Abraham-Behor de Camondo (ill. 2) standing as a patriarch with an expression both piercing and benevolent at the same time. The two private residences of the Camondo family overlooking the Park Monceau are also evoked here along with the extraordinary collection of Impressionist works belonging to Isaac de Camondo (1851-1911) as recalled by a young girl with a straw hat by Renoir and a beautiful photograph of the Degas room in his apartment on the Champs-Elysées (Paris, circa 1910, Musée des Nissim de Camondo), a sort of prelude to the Musée d’Orsay ! We have to enter the third space before finally reaching the heart of the exhibition : James de Rothschild ! The professional, personal and social life of the 19th century Tycoon is generously evoked with documents and art works. Of note is the title of nobility which turns the banker and his four brothers into Barons of the Austrian Empire in 1822. This item, from family archives held in London, is an important element in the rise of the Rothschild clan. The family is illustrated thanks to a lithograph plate showing the five brothers, the photographs of James’ four sons and the beautiful portrait of his eldest daughter, Charlotte, by Ary Scheffer. This graceful figure in a blue silk dress with fine lace and precious jewels, wrapped in a large pink shawl, expresses all of the melancholy of the Romantic period. The treatment of the fabrics and the glow of the jewels nonetheless reminds us of the model’s high social standing. In fact, it would have been interesting to compare it with the magnificent portrait of Betty de Rothschild, her mother, by Ingres. The sign tells us modestly that the canvas belongs to a French private collection. But it does not require much guessing to understand that it has most probably remained in the family. We will not return to James’ portrait by Paul Flandrin, in which we do not really care for the caricature of the bourgeois parvenu it personifies, when the subject deserved to be better appreciated. The fourth and last room, the largest space in the exhibition, is entirely devoted to what is called "the Rothschild taste", retracing the eclecticism and exceptional quality of the family collections. This begins with a focus on the Rothschild properties. The hôtel at number 19 rue Laffite (ill. 3), acquired in 1818 which belonged to Fouché, Duke d’Otrante, became both the family residence for James and the headquarters for the bank until its destruction in 1969. This activity is evoked in the anonymous canvas from around 1880, showing the library of this financial establishment. The baron was a man of action and in 1836, he had the hôtel on the rue Laffite almost entirely rebuilt, including the new salon François 1 which became the focal point of Parisian high society. In 1817, James purchased the château de Boulogne, built in the late 18th century on the banks of the Seine, on the outskirts of the Bois de Boulogne. Then in 1855, he commissioned the architect, Armand Berthelin (1812-1877) to build a new residence in the Louis XV style, entrusting Eugène Lami with the interior decoration. The ensemble is stunningly luxurious and although the exhibition and catalogue evoke the splendor of the receptions in Boulogne, they forget to explain that this exceptional house has been abandoned since the end of WWII, today falling into ruin. Finally, in 1829 James purchased the château de Ferrières, east of Paris. Between 1855 and 1859, Joseph Paxton, the architect of the Crystal Palace in London, razed the existing building and constructed a fabulous palace for the baron with a square foundation of 65 meter sides, inspired by the Italian Renaissance villas. Embodying the essence of the "Rothschild taste", blending Renaissance and Grand Siècle, the château Ferrières was also a political instrument as underscored by the engraving of Napoleon III’s visit there on 16 December 1862. 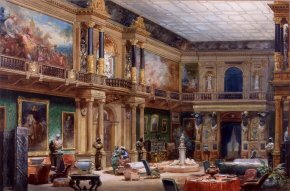 The watercolor of the entrance hall of Ferrières by Eugène Lami (ill. 4), who also participated actively in the decoration of the palace, amply describes the atmosphere of this sumptuous residence. From the start, the Rothschilds saw themselves as major collectors with multiple centers of interest. The last part of the exhibition attempts to give us an overall view of the extent of this eclecticism as well as the donations made to various French museums. 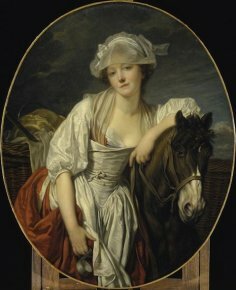 Among the most outstanding objects, of note there is The Milkmaid by Jean-Baptiste Greuze (ill. 5), the first purchase of old masters made by James de Rothschild in 1819 (Musée du Louvre, Charlotte de Rothschild bequest, 1899). When he died in 1868, the collection included sixty-five works, about forty of which were from the Northern European school. We should also mention a candelabra of the Reconsecration (Hanoukkiyyah), Italy, 18th century (Musée de Cluny, on deposit at the Musée d’art et d’histoire du judaïsme, Charlotte de Rothschild donation, 1899), a beautiful sculpture of a Saint and Martyr Holding a Book and a Palm Leaf, southern Champagne, 16th c. (Musée du Louvre, Adolphe de Rothschild bequest, 1902) and the gold coins from the Roman period (BNF, Baroness Edmond de Rothschild donation, 1934). Baroness Salomon de Rothschild left a significant bequest in 1922, characterized by two exceptional silver pieces at the Musée de la Renaissance in Ecouen : a nautilus shell fashioned as a goblet with the representation of Neptune (ill. 6) and a repoussé silver aquamanile in the shape of a flying dragon (Spain, 17th century). Lastly, the library left by Henri de Rothschild (1872-1947) to the Bibliothèque nationale when he died, one of the most beautiful book collections that ever existed is generously presented here. Illuminated manuscripts and autographed letters by famous figures such as Pierre de Ronsard and Jean-Jacques Rousseau can be seen in the room’s central display case. A catalogue also accompanies the exhibition and, on the contrary, first treats the history of the Rothschilds, starting with James, before looking at the Pereires and de Camondos. Definitely of lesser ranking than the volume published in 1996 by Pauline Prévost-Marcilhacy, it is nevertheless an honorable reference work. The chapter on the family’s philanthropical activities, often unknown, allows us to better understand the complex personality of this extended family. However, in the end, it all smacks of too little, a far cry from the Rothschild flamboyancy. This exhibition (initially not planned in the BNF program and hastily organized) can be seen more as a public showcase for a family which does not really need it rather than as a veritable in-depth retrospective. Appearances are saved and the work is well done but anyone familiar with the magnificence of the Rothschild collections for over two hundred years, the quality of the donations and bequests in many museums and what still remains in the hands of the descendants, will be disappointed at finding such few truly exceptional objects and is left to imagine a show which might indeed be in keeping with the renown of the Rothschild family. Visitor information : Bibliothèque nationale de France, Site Richelieu, 5 rue Vivienne, 75002 Paris. Tel : 01 53 79 59 59. Open from Tuesday to Saturday 10 am to 7 pm and Sundas from 12 noon to 7 pm. Admission : 7€ (reduced : 5€).